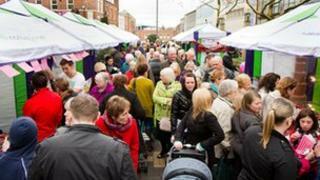 A record 96,000 visitors attended Wakefield's rhubarb festival over three days, according to the council. Spending at the sixth annual Food, Drink and Rhubarb Festival boosted the local economy by £2m, the council estimated. Wakefield lies in the so-called "rhubarb triangle" between the city, Leeds and Morley. Councillor David Dagger, cabinet member for culture, said the festival had got "fantastic feedback". Mr Dagger said the festival brought a "real buzz" to the city where rhubarb has been a part of the local economy for about 170 years. A speciality of the Yorkshire triangle is "forcing" the rhubarb by growing it indoors under dark and warm conditions in long, low sheds. It helps to produce a sweeter taste because the rhubarb uses its own sugars to grow in the absence of the sun. The industry is much reduced now with only a few of the forcing sheds remaining. In February 2010, Yorkshire forced rhubarb was awarded Protected Designation of Origin status by the European Commission. Other products to be designated include champagne and Parma ham. The festival, organised by Wakefield Council, was held between Friday and Sunday and takes place in February every year.